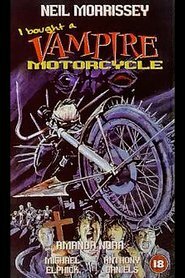 I Bought a Vampire Motorcycle is the definition of “Good Bad”, from the title that describes the entire plot, to the broad-brush performances, to the suspension of disbelief that comes when you know the budget is laughably small, but you *don’t care*. Those who love the work of Troma will discover that the British can do the same thing, and with even more gore and humour. Neil Morrissey, pre “Men behaving Badly”, plays Noddy, an innocent young Birmingham motorbike courier who buys a classic Norton with a dark history. What follows provides a hilariously imaginative reworking of every scene you’d expect from a self-respecting vamp flick, but on two wheels and set in Birmingham. The special effects are zero-budget but enthusiastic, and the title creature in its mutated hunting guise is a highly impressive piece of kit, complete with Ancient Briton-style axle blades. Morrissey looks as terrified and bemused as the script requires him to be, but the film is stolen by Anthony “C3PO” Daniels as a camply gung-ho biker exorcist, complete with razor-sharp throwing-crosses. Michael Elphick provides sterling support as a Sweeney-esque copper with a life-saving taste in snacks. As the punk rock soundtrack pounds (complete with inevitable theme song “She Runs On Blood…She Don’t Run On Gasoline) and the severed heads of Hells Angels fly across the screen, you will revel in thrills, spills, cheap sexual innuendo, and low comedy. See it.